Seeing your trip meetings and their location plotted on a map can be useful for travel planning. Especially if your trip is to a new location, seeing who and what are nearby can save you valuable time. Within any EverTrue trip, you'll be able to see all of your meetings plotted out on a map based by toggling over from the Itinerary view to the Map view. Note, the map view will be disabled until a meeting is created. 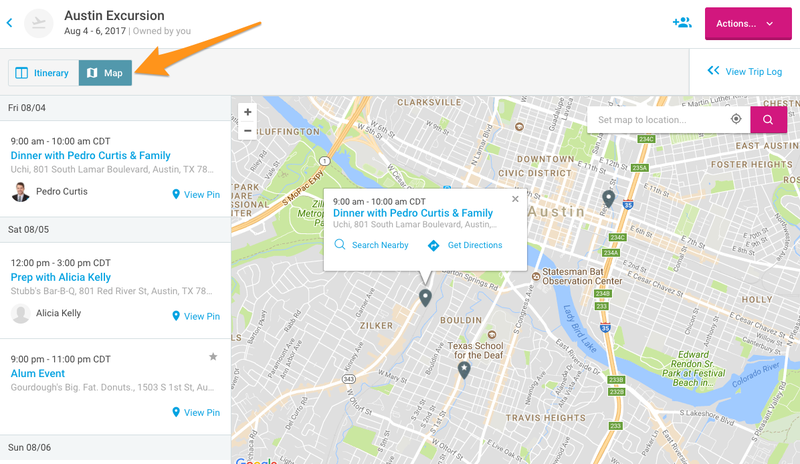 You can quickly click on any plotted meeting on the map and choose to "get directions" or "search nearby" to see other constituents in the area if you're looking for a filler visit. All trip meetings will be shown on the left-hand side bar in chronological order.